Bas-relief tiles are the distinctive path to ambience in decor. 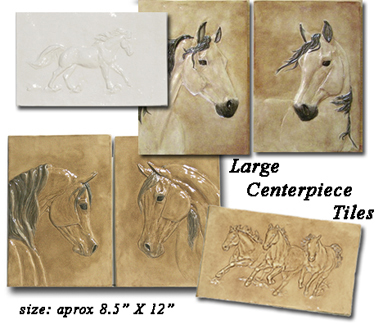 We offer unique, all original horse and country tile designs that are only available here. Now you who live or love the equestrian or ranch lifestyle have imagery available for your decorating needs. Bas-relief tiles include horse centerpiece and accent tiles, saddle maker mural, reining horse mural, cow centerpiece tile, coming soon are dog tiles. These impressive sized works of art look fabulous mounted anywhere! Each tile is aprox 8"x12" which makes the sets aprox 16"x12"
kichen backsplash or the fire place, certainly makes an impressive statement. These are often used with a Centerpiece tile to carry the theme throughout the room.